Wild animals and their habitats are exposed to multiple impacts caused by hunting and many other often overlapping and competing land-use activities within the wildlife habitat. In particular in multiple-use cultural landscapes the resulting interaction between habitat requirements of wild animals, hunting interests and other land-use demands often leads to conflicts that can negatively affect sustainable conservation of native wild animal species and their habitats, the sustainability of involved forms of land use, and sustainable regional development at large. Stand-alone sectoral approaches to sustainable use are insufficient and often result in unintended adverse effects on other land use sectors and the respective ecosystem. In contrast, sustainable wildlife management requires that all land-user groups in the wildlife habitat are aware of and consider the effects of their activities on both wildlife resources and other user groups. With this in mind, concepts and tools for integrated, i.e. cross-sectorally harmonised sustainability assessment of several land-user groups have been developed in the model region “Wienerwald Biosphere Reserve” based on the example of "wild animals and hunting." The Wienerwald Biosphere Reserve is an intensively multiple used region (particularly forestry, agriculture, hunting, and different kinds of leisure activities) sited near to Austria`s capital Vienna, and (as specific for biosphere reserves) main aim is the development and implementation of sustainable land use concepts. Application-oriented and participatory research methods have been applied to identify, analyse and evaluate key interfaces and linkages (antagonistic and synergistic interactions) between wildlife populations, wildlife habitats and different forms of regional land use. The main project outputs are four operational sets of principles, criteria and indicators for integrative sustainable wildlife management, focused on the major regional land-user groups forestry, agriculture, hunting, and recreation management. These four assessment sets are harmonised across the land-use sectors and designed as self-evaluation tools; they shall be applied by each of the four land-user groups in order to evaluate their own respective influence on the sustainable conservation of wild animal species, their habitats and sustainable hunting. The assessment framework of each group also considers relevant sustainability requirements of other user groups. By focussing on the cross-cutting issue "wildlife management", the step from merely sector-specific towards cross-sectorally integrated assessment of sustainable use has been taken for the first time. Moreover, recommendations for integrative sustainable wildlife management and for respective monitoring have been elaborated. Project results shall contribute to the avoidance, mitigation and resolution of wildlife land-use conflicts and to the integration of wild animals and their management into a sustainable regional land-use system. The land user groups of the model region comprise private, community, and public organizations. The full-length publication of the final project report (in German), including the assessment sets as annexes, is available for download at the homepage of the Austrian Academy of Sciences (Reimoser et.al 2009; http://hw.oeaw.ac.at/ISWIMAB ). Wild animals and their habitats are exposed to multiple impacts caused by hunting and many other often overlapping and competing land-use activities within the wildlife habitat. In particular in multiple-use cultural landscapes the resulting interaction between habitat requirements of wild animals, hunting interests and other land-use demands often leads to conflicts that can negatively affect sustainable conservation of native wild animal species and their habitats, the sustainability of involved forms of land use, and sustainable regional development at large. Stand-alone sectoral approaches to sustainable use are insufficient and often result in unintended adverse effects on other land use sectors and the respective ecosystem. In contrast, sustainable wildlife management requires that all land-user groups in the wildlife habitat are aware of and consider the effects of their activities on both wildlife resources and other user groups. With this in mind, concepts and tools for integrated, i.e. 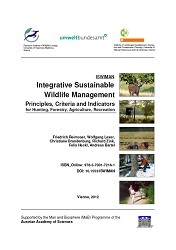 cross-sectorally harmonised sustainability assessment of several land-user groups have been developed in the model region “Wienerwald Biosphere Reserve” based on the example of "wild animals and hunting." The Wienerwald Biosphere Reserve is an intensively multiple used region (particularly forestry, agriculture, hunting, and different kinds of leisure activities) sited near to Austria`s capital Vienna, and (as specific for biosphere reserves) main aim is the development and implementation of sustainable land use concepts. Application-oriented and participatory research methods have been applied to identify, analyse and evaluate key interfaces and linkages (antagonistic and synergistic interactions) between wildlife populations, wildlife habitats and different forms of regional land use. The main project outputs are four operational sets of principles, criteria and indicators for integrative sustainable wildlife management, focused on the major regional land-user groups forestry, agriculture, hunting, and recreation management. These four assessment sets are harmonised across the land-use sectors and designed as self-evaluation tools; they shall be applied by each of the four land-user groups in order to evaluate their own respective influence on the sustainable conservation of wild animal species, their habitats and sustainable hunting. The assessment framework of each group also considers relevant sustainability requirements of other user groups. By focussing on the cross-cutting issue "wildlife management", the step from merely sector-specific towards cross-sectorally integrated assessment of sustainable use has been taken for the first time. Moreover, recommendations for integrative sustainable wildlife management and for respective monitoring have been elaborated. Project results shall contribute to the avoidance, mitigation and resolution of wildlife land-use conflicts and to the integration of wild animals and their management into a sustainable regional land-use system. The land user groups of the model region comprise private, community, and public organizations. The full-length publication of the final project report (in German), including the assessment sets as annexes, is available for download at the homepage of the Austrian Academy of Sciences (Reimoser et.al 2009; http://hw.oeaw.ac.at/ISWIMAB).